When did the Academic Health Center become the Academic Health Center? For the first twenty-some years, the Academic Health Center was actually referred to as the University of Minnesota Health Sciences Center. At some point the moniker changed and we became the Academic Health Center. Sometimes it is the simple questions that can be the most difficult to answer. A name change is usually a fairly significant event, but in certain cases it can be elusive to pin point an exact date especially if a string of attributive adjectives gives way to a proper noun. The phrase “academic health center” is a common term found in the discussion of health sciences education since the 1940s. Yet, documenting the use of the name as it relates to Minnesota helps narrow the specific point we stopped referring ourselves as the Health Sciences Center and became the Academic Health Center. The Board of Regents organized the Health Sciences in July of 1970 without using the term Academic Health Center or Health Sciences Center. Jump ahead to May 17, 1994 when the Board of Regents appointed William Brody as Provost. This documents the still institutional use of Health Sciences Center. On September 9, 1994, President Hasselmo presented to the Board of Regents the “Recommendations on Organizational Structure for Central Administration” and specifically discussed the creation and appointment of the provost position overseeing the Academic Health Center. Hasselmo noted the Regents’ approved the creation of the Provost, Academic Health Center in December 1993, but the actual terminology used in the minutes is Health Sciences Center. He also inaccurately stated that the recruitment of the Provost, Academic Health Center, occurred in May 1994 when in reality it was of the Health Sciences Center as documented above. It turns out it is Hasselmo’s presentation and his anachronistic references that are the true first documented uses of the proper noun Academic Health Center and its replacement of Health Sciences Center at the University of Minnesota. They are further institutionalized by inclusion into the Regents’ minutes that same day as an approval of the “Restructuring Central Administration” motion. In archival parlance, provenance refers to the original source or creator of a collection of material. Provenance is fundamental to preserving context for records and is the principle that provides the authority we give to records as being original. After establishing provenance, archivists seek to preserve the original order of the material. This is generally considered the same sequence the original creator stored the records. It preserves the context of the materials. Then there are times when records come to the archives without any provenance and are out of sequence. When enough clues are available, the restoration of original order is the best possible solution. Such is the case with two folders labeled “Wilson, Dr. L. B. Mayo Foundation Rochester Minn.” One dated “1921-1925,” the other “1926-“. Found among 1970s Medical School administrative records, the look of the folders, the dates of the material, and the content they contained all support the conclusion that they were not created by the dean’s office of the 1970s and were thus out of context and without an established provenance. 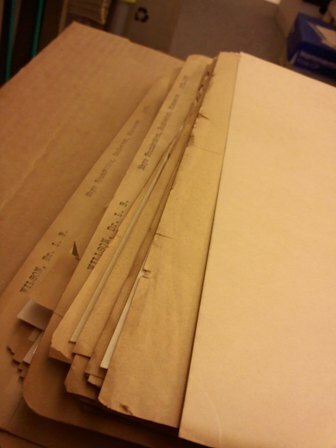 These folders primarily contain correspondence between Louis B. Wilson and Clarence Jackson, then head of anatomy at the University of Minnesota. The letters pertain to the transfer, release, and burial of corpses used for dissection between the University of Minnesota and Mayo. It can be said that due to their intimate knowledge of an institution and changes in an organization over time that archivists figuratively know where all the bodies are buried. Yet, these two folders quite literally tell the story of where they are buried. The “they” being unclaimed bodies available for anatomical study and managed by the Medical School according to a 1913 state law. At some point between 1926 and 1951 someone removed these two folders from the Dept. of Anatomy, yet the folders managed to remain paired together as they moved from office to office, hand to hand over the next 60 to 80 years until finally sent to the archives. The transfer of these seemingly miscellaneous materials to the archives was the key step in restoring their provenance and establishing their original order. I’ve always been somewhat fascinated with the terminology used in archives and the inherent problems and contradictions it can cause when those same terms are crossed with another field or discipline. Of personal interest are such terms as “preservation�? and “conservation�? and how these terms have very practical applications in archival work and also have implications in archival theory. Comparing and contrasting these definitions with their use in environmental protection sets up archives as a single field among many interested in the long-term use and access to rare and unique resources. That, however, can be the topic of a different post. The Glossary of Archival and Records Terminology addresses these issues of archival lexicon in an introductory essay. Yet, the reality can sometimes become all too apparent when the words used and the confusion over their definitions means a loss to the archival record. Today, I’d like to address the term “papers.�? The Glossary provides these definitions for words that are at times used interchangeably. Papers: 1. A collection. – 2. A collection of personal or family documents; personal papers. – 3. Government • Records indicating an individual’s identity or status. Personal papers: 1. Documents created, acquired, or received by an individual in the course of his or her affairs and preserved in their original order (if such order exists). – 2. Nonofficial documents kept by an individual at a place of work. Manuscript: 1. A handwritten document. – 2. An unpublished document. – 3. An author’s draft of a book, article, or other work submitted for publication. When trying to collect the papers of those in higher education, I believe archivists are competing with terminology already ingrained in the population by the publishing world. Paper equals article. Manuscript equals a pre-publication work. Why the interest in papers? Today I learned that nearly 12 boxes of correspondence and related work materials for a prominent individual in the veterinary sciences were recently destroyed (this is unrelated to another recent loss in the vet sciences). In this specific case, it was believed that papers referred to the published work of the individual. A reasonable interpretation given the publishing environment academics work in. Is “personal papers�? that much more clear? Not likely. Manuscripts? Again, the connection to publication is forefront with most. So, the education continues. Both for the community I am collecting from on what archives are as well as for myself on how that community perceives the work we do.